Financial terms of the deal are not being disclosed; Conti said the contract has obtained the required vote of shareholders, but remains subject to final approval by the U.S. Federal Trade Commission and Department of Justice. According to a Reuters news report, Conti’s stake will be 81 percent with Daimler retaining a 19-percent share. Continental A.G. has acquired a majority ownership stake in Zonar Systems Inc.
Zonar President Ian McKerlich said having the “backing of a respected global brand that recognizes our need to serve our markets as a nimble, innovative, customer-focused company as we have for the past 15 years” and noted that Zonar will benefit from having “expanded technological resources and capabilities” from Continental. Zonar will be integrated into Mr. Ruf’s division, which is based in Regensburg, Germany. Established in 2001, Zonar pioneered smart fleet telematics with patented operations technology across all commercial transportation markets: commercial trucking, vocational and passenger fleets. The firm’s suite of solutions drives safety, efficiency and fuel savings—from drivers to dispatch to administrative operations. 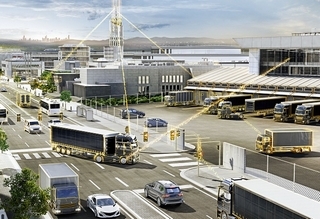 Zonar claims 450,000 users and is the exclusive OEM partner for Daimler Trucks North America’s Virtual Technician solution installed on more than 200,000 Daimler trucks.